So deciding on the Webster as a simple build (I use the word simple loosely) I started to get materials collected. 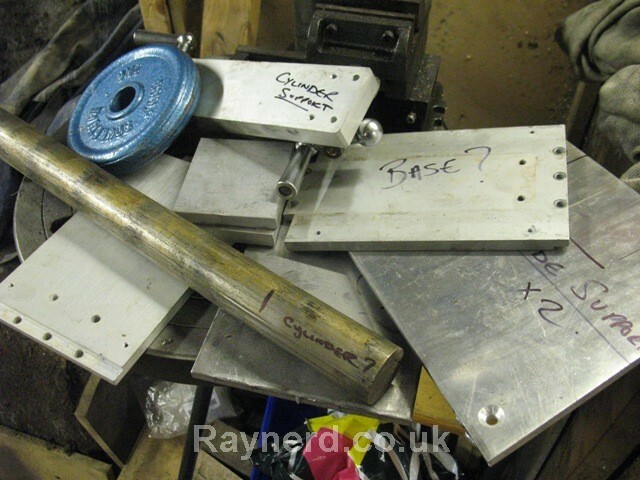 I snagged a lot of aluminium plate from the scrap heap several months ago and finally I`ve been lucky in the fact that I`ve got pretty much all the sizes I`ll need. Unfortunately I did not have the cast iron or leaded steel for the cylinder so I purchased that a few weeks ago and insisted that my wife and daughter come with me on a on a "Christmas" trip to Buxton, coincidental of course that Macclesfield was the first stop with MaccModels open and with a piece of cast iron cut, waiting for me, almost likes I`d pre-arranged!! I also ordered a small NPK spark plug that cost £3 on ebay but I`ll need a M10 x 1.0 tap which is annoying, my M10 taps are all M10 x1.25mm. I then had to think about the carb. The thought of purchasing a RC IC engine pre-built carb seems like cheating when it plays such a pivitol part of the engine runnings but maybe I`m wrong in those thoughts!! I haven`t read about too much success with the carb design with the Webster but I believe that the carb from drawings published in ME for the Nemett 15S works very well so I think I`ll run with that. Well after all that thinking ... time for some chips . It always takes me bloody ages to just cut the pieces, infact it took me a few nights just to rough out a few pieces from the big sheets of aluminium. Here are the two side supports, the one blued up is to size, the back longer support is just roughed out. I`m in a bit of a pickle with regards to the base. I`ve nothing really suitable and can`t afford a piece of ally big enough just for the base of this. I think this piece will do, but it is a little bit thin, then again my plan is to raise the base on pillars so the electrics can go under it. And with so much success, I had to fall over some where! but hey ho! I`m going to go and bore it and hopefully it`ll still run, just the gap between the fins is wrong. Two stupid errors, I misread the plans and then to compound the issue, the work managed to move from the 3 jaw during grooving!! ...and that is pretty much where I am up to right now. 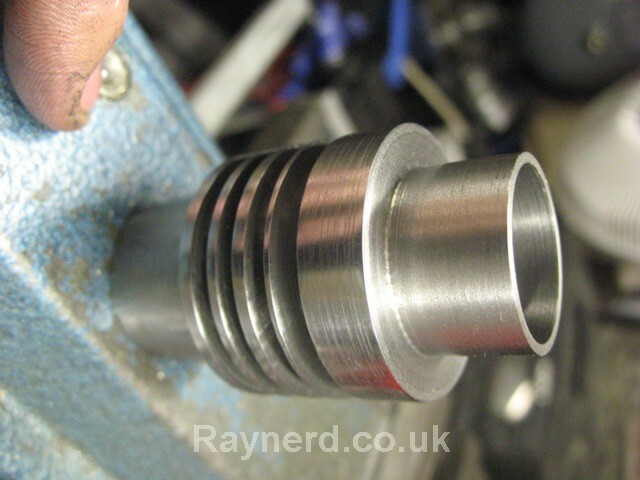 Next job is to mount the cylinder again for boring between centres. Hard to imagine and engine when you see a pile of bits!!! Nice 1 Chris, the fins won't matter a jot! That base looks thick enough to me, how thick is it? Some engines you see are vastly over engineered for the scale if you think about it. Can't wait to see more! Fins? They're only a bit different to drawing! What's wrong with a bit of character? You`re off and running Chris! Chris, how ever you change or modify your Webster makes it unique. Makes your engine have the character and style you want. I thought it looked a bit pitted but it's turned up fine. Buying the proper metal for the job on my last couple of engines has made things much easier I must admit, rather than routing around in the scrap box and not knowing what you're about to machine! Hi guys, thanks for the replies. Yes the cast is a pitted and had a hard surface but once that was off, cut at low spead it cut well. 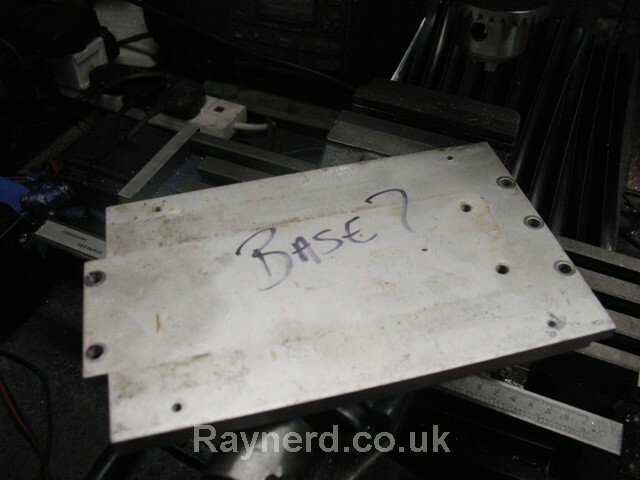 Regarding the base, it is about 7mm and the plans call for 9.5mm or there abouts. 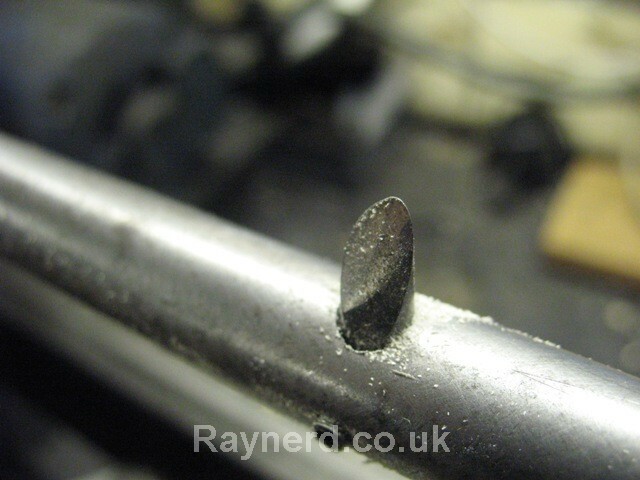 I`m not too worried for strength, it is more for the depth of counter sinking my cap head screws. I think I`m fairly sure I`m going to lift it a bit so for now I`ll have to pop it on some little feet to give it a bit of lift. I just can`t justify the cost of such a big plate of ally for this project when I`m sure I can make do with the plate I have. Not much, but maybe time to bore the cylinder tomorrow! Looks like you've done a fair bit of planning and preperation work on this job which is a wise move. I've never tried this - but won't there be too much 'give' in that wood? I woodn't have thought it rigid enough, in particular it looks like pine or spruce which isn't a particularly dense material. Would a small 'sub table' mounted on jacks not be better? 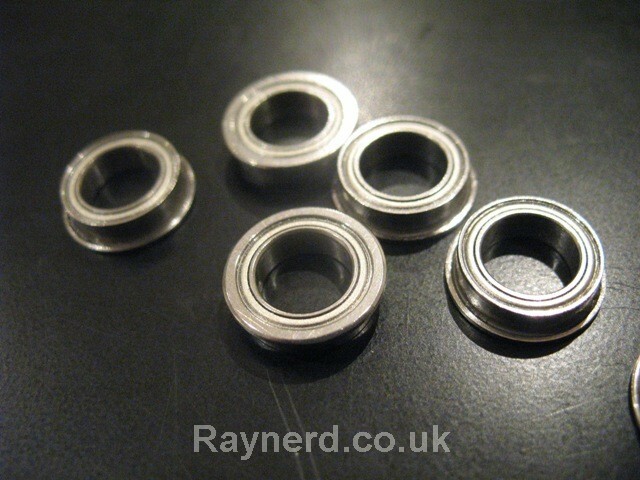 I made a set of boring bars - with micrometer adjusters ages ago (from Hemingways plans) but never used them. Mounting the work has always put me off, plus my lathe is set to turn parallel (whereas I'm always tweaking the tailstock, so that would need setting prior to the job) and never had anything needing boring that was so long as to be out of reach of my longest boring bar. 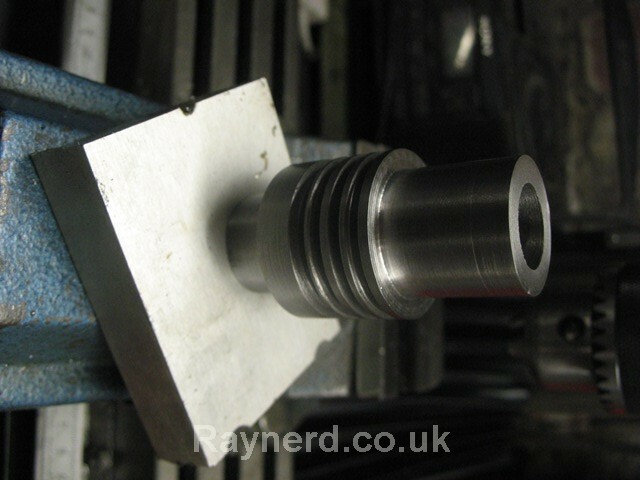 Boring bar looks good Chris, just a quick point that I fell foul of when turning a recess on my flywheels, is the radius on the bottom of your tool less than the radius of the bore, otherwise it will foul. You sure that is silver steel? Doesn't look like it but don't think it'd matter. 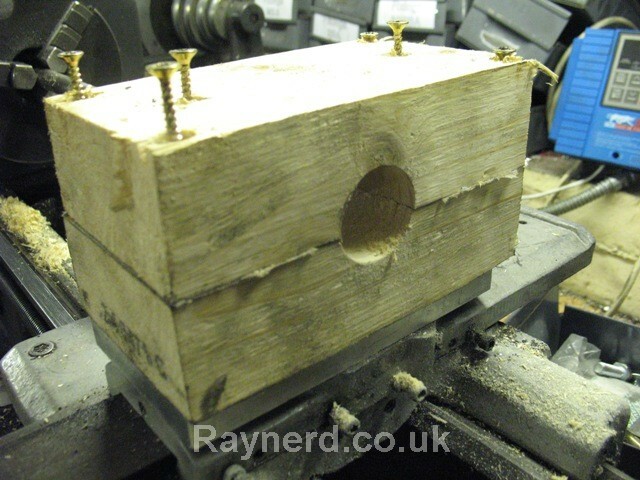 If you can't counterbore enough, just counter bore the wooden base instead? 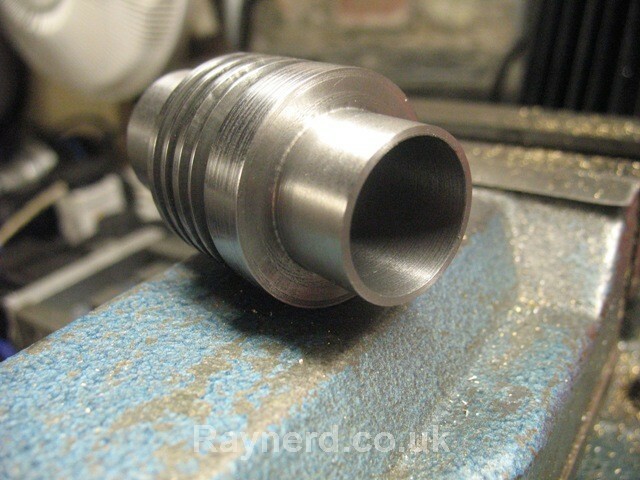 I didn't counterbore my alloy base for my ridders flame licker, just put cut outs in the wood, was much easier! Before I start tonight I must remember to put the pieces of card inbetween the blocks so it was good that you raised the point as it made me go back to that post!! I didn`t have a long enough boring bar for the job BUT as Stew mentioned in an earlier message in the thread I linked to above, I could have easily made one. To be honest, I`ve never done this and in my mind it seems a nice way of getting a clean bore. I`ll take light cuts as not to put too much strain on the work and holding fixture. I`ll see how it goes but I do appreciate and understand your thoughts. NickG - good advice. 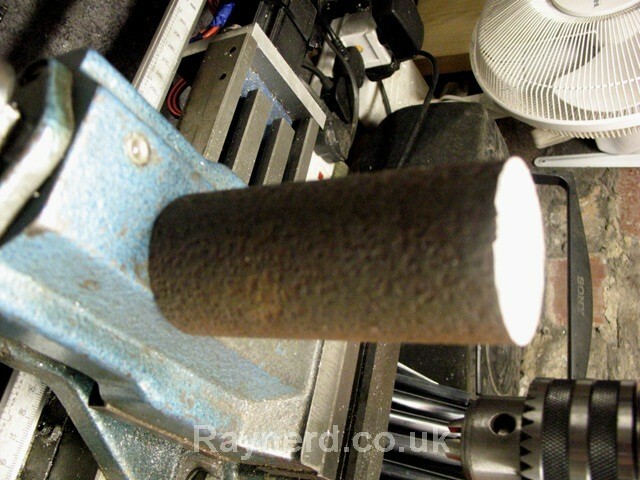 The tool is HSS as it was hard to grind but yes, I did insert the tool into the boring bar and then realised the starting bore is smaller than the back of the tool fouling so I had to grind it much shorter. I`ll give it a bash later tonight, hopefully it`ll work! Going back to the first parts of your build, about the finning. When working from plans, people follow them religiously and sometimes have trouble replicating them exactly. When the chappie first came up with the drawings, he worked with what he had, if you don't have the same materials and tooling, it can be a little difficult to follow the build exactly. There is a secret to it all. If you can keep the major dimensions correct and in the right positions, then everything else can be swapped about or cut out to whatever takes your desire. That is why some of us can make an engine look totally different from the original, but still have it work exactly the same way. Things like bore and piston materials and their sizes should be the same, as should crank positions and throws and everything else that is critical to the running, but everything else is pure bling target fodder. 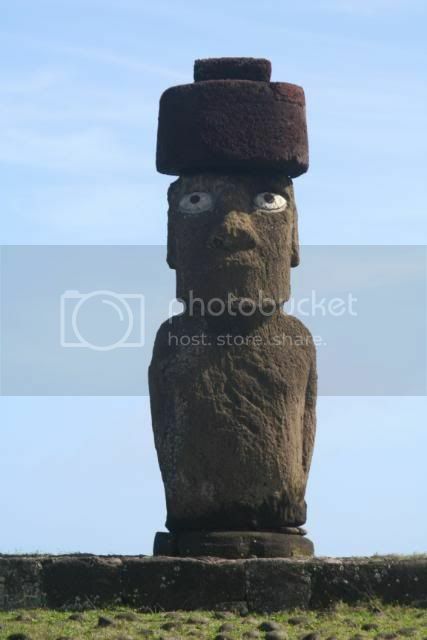 In fact, you could most probably easily take the critical dimensions and turn it into a vertical engine, or even on it's side, nothing is written in stone. So don't worry too much if it doesn't look exactly the same as the original, we are all allowed some 'artistic licence'. Sorry, Chris I wasn't clear - I just meant was the bar itself Silver Steel? Usually it has a ground finish and doesn't seem to rust that's all. Don't think it'll matter though. Sure it'll work great, as John said I always try to make things to suit what I have. Poppin is the only exception which I bought material for as I wanted to build as close to plans as possible but even still there are a couple of odd tweaks on that. Cheers for the post John...I do know what you mean. Yes, I`ll be sure to make a boring post tonight. I was going to say "make sure your tailstock is bob on" but I've suddenly realised it makes no difference whether the tail stock is centred or not! Might give it a go next time I do a cylinder. 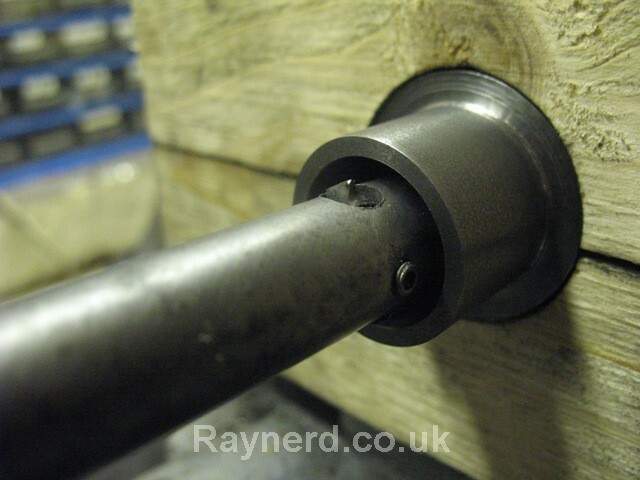 Kwackers, you weren't the only one, I thought the same about tailstock then realised it doesn't make any difference! Well there will be no boring post until weekend as I woke my daughter up cutting the wood, got a rollocking of the wife and was made to stop. So, as a consolation have made this boring post instead. I did the same, well my son woke up as I came upstairs but I escaped the blame some how! I'll get it in the neck now though being up this late, am knackered - waiting for something to upload! 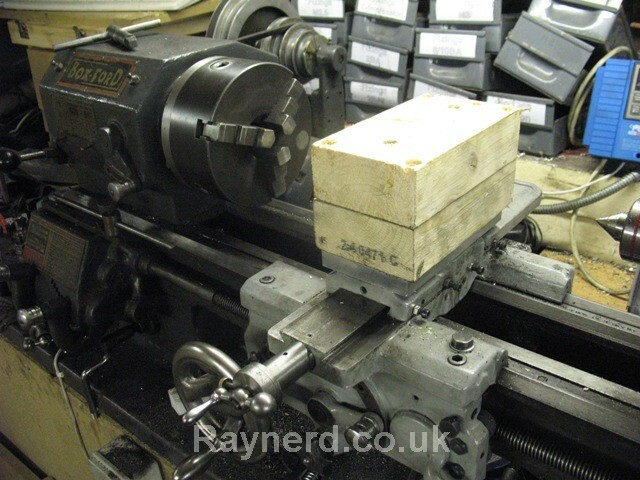 I made a vernier adjustment for the cutters on my boring bars, but one thing about the tailstock not needing to be centred is that (assuming the cutter is aprox in the middle of the bar) then for every thou you move the tailstock off centre you'll increase the diameter of the bore by about a thou. So could be a good way to fine tune the bore size. That's a good idea and that angle shouldn't make any difference to the cutter angles. Here is a little update, only had a few hours on this over weekend but just enough time to turn the bore and I`m absolutely chuffed to bits. It worked a dream and there is no sign of a taper. 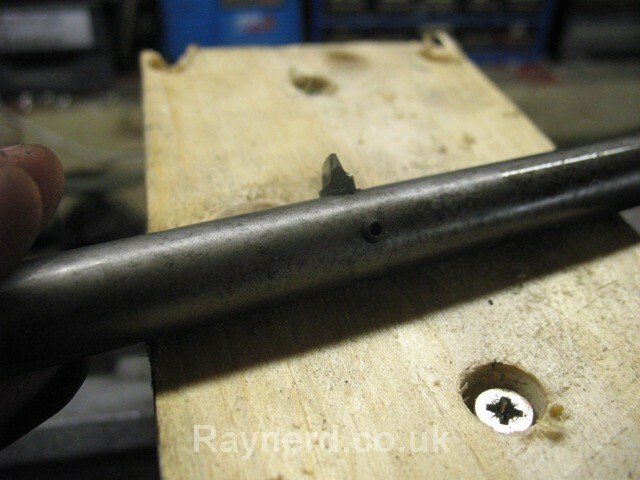 I have even turned up a little go-no/go bar and it works perfectly on both ends and of course measuring shows the same. I have to admit that it took a bit of getting use to and confidence/trust in measuring it but I couldn`t have done it without my measuring tool - cheers Rob for the info on this. I actually spent a good 20 minutes taking cuts to a purposely small diameter and then removing the boring bar to make measurements just to check all was going well and practicing before I took the final cuts to size without removing the boring bar and trusting in my measuring tool that I made and posted about in the first post. I have to admit, I was concentrating so hard that I have mocked up for the picture below, the bore was actually cut!! I actually used this cutter for the wood, the other was too fine a point and was ripping the wood rather than cutting it. 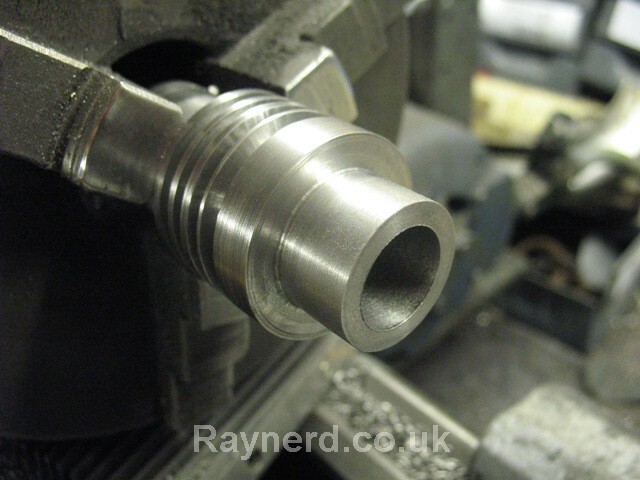 Cutting the bore was also good practice! 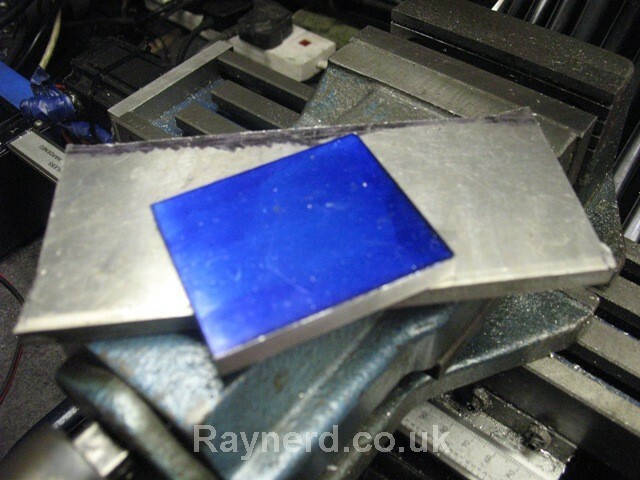 So here is the mock up - as you can see my bar was 0.625" so only needed a small projection of the cutter. It was nice and sharp and the cast just powdered off. Bore all nicely cut and final cylinder ready! Well this method took a lot of effort and many hours of extra work in making the necessary tools but I`m really pleased with how it turned out and certainly another method under my belt for future. Good finish as well! 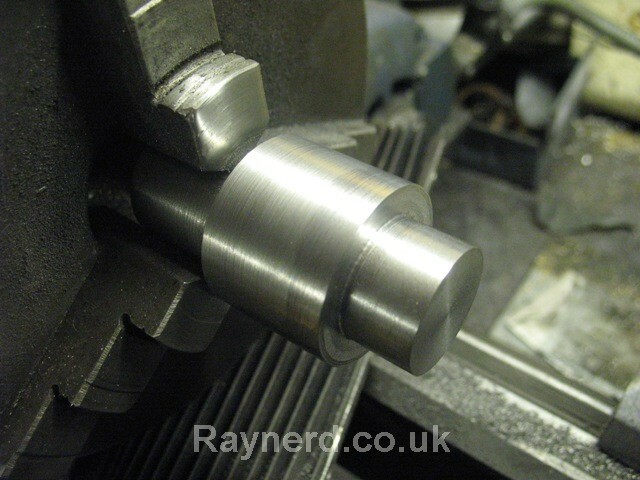 Bore is bang on 0.875 perhaps touching 0.876" - certainly good enough for me and I hope good enough to run! Thanks to everyone who suggested methods of cutting the bore and gave me advice in any way. Nice job. This will give a few new people a few ideas on how to solve a problem. This is the beauty of our machining hobby so many ways to skin a cat and all have pluses and minuses, a job well done now scrub your lathe clean son get rid of all that organic matter.